Overbrook Park is a neighborhood in the West Philadelphia section of Philadelphia, Pennsylvania, United States. It was founded in the 1940s on the site of a former farm known as Supio's farm, offering new housing for returning GIs and their families. Overbrook Park remains a stable,safe, African-American middle-class neighborhood. 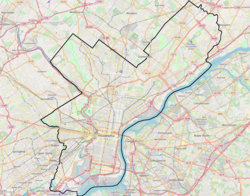 Overbrook Park is bounded by Overbrook on one side, Penn Wynne on another side, Indian Creek (a tributary of Cobbs Creek) and park land on a third side, and a golf course on the fourth side. The main artery is Haverford Avenue which goes into Penn Wynne across City Avenue where it becomes Haverford Road. Haverford Avenue and 75th Street connect it to Lansdowne Avenue on the Overbrook side. Haverford Avenue, 76th Street, and 77th Street connect it to City Avenue on the Penn Wynne side. The neighborhood spans for approximately four city blocks west to east along City Avenue, and approximately ten smaller blocks north to south on either side of 76th Street. Overbrook Park has a public school named after Robert Eneas Lamberton, a former Republican mayor of Philadelphia. It was once a K-12 school and the only one of its kind in Philadelphia. Today it is a K-8 school. Lamberton School is located at 75th Street and Woodbine Avenue. Overbrook Park used to have a large Jewish population. There was an Orthodox and a Conservative synagogue. Most of the Jews have moved across City Avenue (U.S. 1) into neighboring Penn Wynne in Lower Merion Township. The Jewish community of both sides of the border are considered to be one unit and are connected by an eruv, a wire attached to the telephone and electric poles which allows religious Jews to carry things on Shabbat. The Orthodox Congregation Beth Hamedrosh was founded in the late 1950s as a branch of Beth Hamedrosh HaGadol in West Philadelphia. The congregation moved to Penn Wynne in May 2007, after having purchased the site in 2000. The Building that housed Beth Hamedrosh is now Temple Kefarym, a Black Hebrew congregation which is now boarded up following a fire. The Conservative Congregation Beth T'fillah, originally called Overbrook Park Congregation founded in 1948, closed down in the Fall of 2006 and merged with Temple Adath Israel in Merion, Lower Merion Township due to a lack of sufficient membership. The building that housed Beth T'fillah is now Overbrook Park Church of Christ. Despite the demographic change, there are still several kosher establishments in Overbrook Park, among them a kosher fish and produce store, a kosher bagel store, a kosher pizzeria, and a kosher bakery. As of late 2015 a new kosher sushi restaurant opened on Haverford Ave, but has since closed. You can also find traditional Philadelphia Hoagies at Ferrante's Meats and More and cheese steaks at Stacy's Pizza. In 2017, Chabad of Penn Wynne and Congregation Beth Hamedrosh, formerly of Overbrook Park, were awarded a grant by The Kohelet Foundation to assist with promoting Overbrook Park as an affordable neighborhood for young Jewish families. Overbrook Park is the birthplace of actor Seth Green. Allen Meyers (2001). The Jewish Community of West Philadelphia. Arcadia. ISBN 0-7385-0854-3. "A City Transformed. The Racial and Ethnic Changes in Philadelphia Over the Last 20 Years". The Philadelphia Research Initiative. June 1, 2011. ^ William Labov (2001). Principles of linguistic change: Social factors, Volume 2. Language in society. Wiley-Blackwell. ISBN 0-631-17916-X. ^ "Building "Keruv". The Main Line Eruv". The Philadelphia Jewish Voice. September 2006. ^ "Torah Scrolls Brought to New Home of Beth Hamedrosh". The Philadelphia Jewish Voice. July 2007. ^ Julian H. Preisler (2008). Historic Synagogues of Philadelphia & the Delaware Valley. The History Press. pp. 47, 48, 102. ISBN 978-1-59629-572-8. ^ "Phila. v. Overbrook Park Congregation". Justia Law. Retrieved 2017-06-27. ^ Julian H. Preisler (2008). Historic Synagogues of Philadelphia & the Delaware Valley. The History Press. p. 52. ISBN 978-1-59629-572-8. ^ "CJC Seeks CJC for a Serious Long-term Relationship". The Philadelphia Jewish Voice. October 2005. ^ "The Kosher Table: R&R Produce and Fish". The Philadelphia Jewish Voice. February 2006. ^ "The Kosher Table: New York Bagel Bakery". The Philadelphia Jewish Voice. February 2006. ^ "Kosher Establishments in Philadelphia, PA". Kosher Delight. ^ Kurland, Rachel (2017-03-15). "Kohelet Foundation Awards Grant to Wynnewood-Area Shuls for Publicity Content". Jewish Exponent. Retrieved 2017-05-12. This page was last edited on 26 February 2019, at 12:43 (UTC).